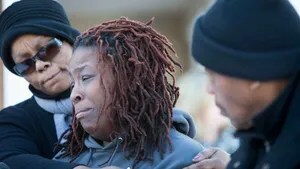 Hundreds gathered Wednesday night at Rose Hill Community Center to pay homage to Jamar Kilgoe, who was killed in the basement of the community center Monday. Kilgoe, 30, was shot dead while recording music in the Rose Hill Community Center’s downstairs studio before work Monday. Family, friends and community members gathered in a tight circle at the center’s parking lot Wednesday night to pray for their fallen loved one. Friends embraced each other and others stood silently. With teary eyes and shaky hands, organizers passed around candles and lighters to the group. The cause for the killing is unknown and the killer remains at large. Police did not have new details on the incident Wednesday, but Rose Hill Community Center clarified that the killer was not a regular participant at the center. Wednesday’s vigil was organized by Pastor Derrick Johnson, who serves at the family’s church in Wilmington. Kilgoe, a father of two, was a well-known local rapper who went by the stage name Young Kolb. The artist served as an engineer at the community center, his father said. He worked with other local artists and local children to produce and record music at the center. Among the speakers was Aria Washington, Kilgoe’s aunt. The center offers a variety of services, including a food pantry, day care, a senior center and a studio where people could record their music. The community center is near where the county plans to build a $21 million library and “innovation campus” that leaders hope will spur a revitalization of the Route 9 corridor. County Executive Tom Gordon said security has been one of the administration’s primary concerns with the library, pointing out that the county plans to build a police substation “right there in the center.” He told The News Journal on Tuesday that police are “putting a full court press” on the investigation. Anyone with information pertaining to this incident is asked to call county police at (302) 573-2800. Citizens can submit tips anonymously by going to www.NCCPD.com and following the link for Tips and Alerts. Contact Greta Iverson at (302) 324-2771, giverson@delawareonline.com or on Twitter @greta_wade. Contact Esteban Parra at (302) 324-2299, eparra@delawareonline.com or Twitter @eparra3.